Add a little personality to your hard hat. Texas America Safety Company is now producing our own line of hydro dipped hard hats. 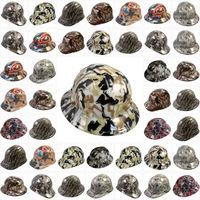 Each one of these hard hats are hand dipped with a one of a kind custom design. Feel free to take a look and see if there is a design you like. Since we have our own line of hydro dipped hard hats, we offer a wide range of designs. On this page, you can check out our general selection, or you can sort our products based on glow in the dark, cap style and full brim styles. 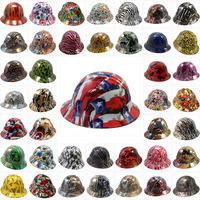 We carry hydro dipped hats in Batman, Bits and Bobs, American camo, American flag, Bootie Girl, blue denim and burning flames patterns. We have a number of camo patterns to choose from, and if you’re someone who’s into carbon fiber, we stock carbon fiber hydro dipped hard hats. Choose from a number of patriotic designs or find other designs that interest you. 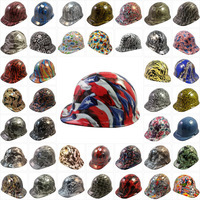 Due to the vast selection of different designs, we have hydro dipped hard hats for men and women. Every pattern features rich colors and quality workmanship. All of these hats are designed to keep you safe and stylish.